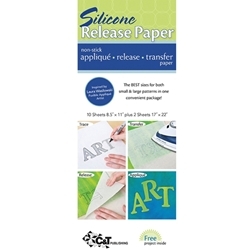 This non-stick appliqué release transfer paper allows you to trace and transfer any sized design with ease. It protects delicate art surfaces, as well as your iron and ironing board during iron-on transfer. The non-stick work surface for is ideal for projects using mediums and adhesives. Great for a variety of textile, art and craft projects.